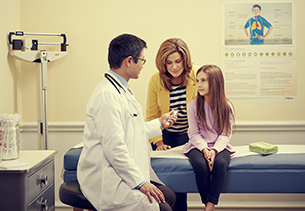 Mylan offers Access and Savings Programs for eligible patients. There’s only one recommended first line treatment for anaphylaxis. EpiPen® (epinephrine injection, USP) 0.3 mg and EpiPen Jr® (epinephrine injection, USP) 0.15 mg Auto-Injectors are intended for immediate administration as emergency supportive therapy only and are not intended as a substitute for immediate medical or hospital care. In conjunction with the administration of epinephrine, the patient should seek immediate medical or hospital care. More than two sequential doses of epinephrine should only be administered under direct medical supervision. EpiPen® and EpiPen Jr® should only be injected into the anterolateral aspect of the thigh. Do not inject intravenously, into buttock, or into digits, hands, or feet. Instruct caregivers to hold the leg of young children firmly in place and limit movement prior to and during injection to minimize risk of injection-related injury. Rare cases of serious skin and soft tissue infections have been reported following epinephrine injection. Advise patients to seek medical care if they develop symptoms of infection such as persistent redness, warmth, swelling, or tenderness at the injection site. Epinephrine should be used with caution in patients with heart disease, and in patients who are on drugs that may sensitize the heart to arrhythmias, because it may precipitate or aggravate angina pectoris and produce ventricular arrhythmias. Arrhythmias, including fatal ventricular fibrillation, have been reported, particularly in patients with underlying cardiac disease or taking cardiac glycosides, diuretics, or anti-arrhythmics. Patients with certain medical conditions or who take certain medications for allergies, depression, thyroid disorders, diabetes, and hypertension, may be at greater risk for adverse reactions. Common adverse reactions to epinephrine include anxiety, apprehensiveness, restlessness, tremor, weakness, dizziness, sweating, palpitations, pallor, nausea and vomiting, headache, and/or respiratory difficulties. EpiPen® and EpiPen Jr® Auto-Injectors are indicated in the emergency treatment of Type I allergic reactions, including anaphylaxis, to allergens, idiopathic and exercise-induced anaphylaxis, and in patients with a history or increased risk of anaphylactic reactions. Selection of the appropriate dosage strength is determined according to body weight. Cox L, Nelson H, Lockey R, et al. Allergen immunotherapy: a practice parameter third update. J Allergy Clin Immunol. 2011;127(1 Suppl):S1-S55. American Academy of Allergy, Asthma, & Immunology website, Conditions & Treatments, Library, Allergy Library, Allergy Shots (Immunotherapy). Accessed February 18, 2015 at: http://aaaai.org/conditions-and-treatments/treatments/allergy-shots-(immunotherapy). EpiPen [prescribing information]. Morgantown, WV: Mylan Specialty L.P.; 2017. Epinephrine Injection, USP [prescribing & patient information]. Morgantown, WV: Mylan Specialty L.P.; 2017. Epstein TG, Liss GM, Murphy-Berendts K, Bernstein DI. AAAAI/ACAAI surveillance study of subcutaneous immunotherapy, years 2008-2012. J Allergy Clin Immunol Pract. 2014;2(2):161-167. Elenburg S, Blaiss MS. Current status of sublingual immunotherapy in the United States. World Allergy Organization Journal. 2014;7:24. Cox L. Sublingual immunotherapy for aeroallergaens: Status in the United States. Allergy Asthma Proc. 2014;35:34-42. Canonica GW, Cox L, Pawankar R, et al. Sublingual immunotherapy: World Allergy Organization position paper 2013 update. World Allergy Organizations Journal. 2014;7:6. EpiPen®, EpiPen Jr®, EpiPen 2-Pak®, EpiPen Jr 2-Pak®, My EpiPen®, EpiPen4Schools®, Never-See-Needle®, and My EpiPen Savings Card®, and the Mylan logo are registered trademarks of Mylan Inc. All other trademarks and service marks are the property of their respective owners. This website is intended for residents of the United States who will prescribe or fill prescriptions for patients located within the United States. If you are a patient, please check out our site for patients.